… I am always struck by the immediacy of Jesus’ ministry. In Matthew’s Gospel this immediacy take on a more mundane but no less important character. 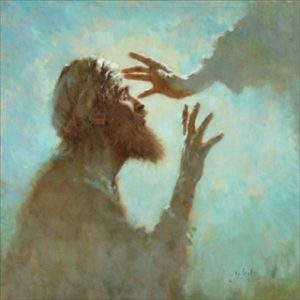 “He healed him” – implicitly Jesus did so immediately. That is what Jesus does. Jesus healed a person. And the object of His action is an unnamed man who is blind and mute. This man is utterly passive in the entire story. Personally, he is demon possessed – he is controlled by satanic impulses. Clearly, someone has led him to Jesus. He didn’t do it himself – he couldn’t have found the way. Someone else had to lead him because of his challenges. He is totally dependent on others – and ultimately he is healed by Jesus. And it all happens in an instant. Can you imagine the change in this man’s life? Blind and mute, he is not seeing and speaking. No doubt those around him were amazed; but what about him? His life has fundamentally changed from here forward. This text is about each of us – we who were blind and mute. Jesus has been working both qu9ickly and slowly in each of us. Quickly in Baptism; slowly in continually opening our eyes and loosing our tongue. The Lutheran Service Book baptismal liturgy captures this sense of immediacy. “Do you renounce the devil? Do you renounce all his works? Do you renounce all his ways?” Yes! is the strong answer to all three. But for those of us baptized as infants, we had others answering with us there. And we have not brought ourselves to the font. Ohers have done so. Why? Because we cannot. Conceived and born in sin, we cannot free ourselves. We are spiritually blind and unable to confess. Christ heals us. He does so immediately – through the means of water and the Word; and immediately by His action we become the children of God. Our eyes are opened and our tongues are loosed. We don’t know anything about this formerly blind and mute man. He shows up and he disappears. What did he do after this? Who knows? What we do know is what Jesus did for him. And what Jesus did for that man, He is doing now for each of us as members of His Church. That is His promise today – … that is His promise always.